Is it going to do me any good? Once you are armed with the knowledge of understanding labels you can make smarter decisions when shopping. Ignore daily intake labels – they are based on average energy requirements and nutrient needs – a 5-year-old girl is not going to need the same requirements as a 45-year-old man. The requirements are usually based on upper limits. Ingredients are listed by weight – so the most used ingredient is first on the list. So run for the hills if you see sugar as the first ingredient. Always read the ingredients label – look for products that have ingredients that you recognise as food. Be careful of marketing lines – when a product says low fat it will probably be high in sugar! What are the biggest things we are trying to avoid? Look to see if sugar is added in the ingredients and where it sits in the list. REMEMBER ingredients are listed by weight. Choose foods that have around or less than 5g of sugar per 100g. Note: 1 teaspoon of sugar is 4g. Remember dairy foods will contain lactose, which is a sugar and will contribute to 4.7g per 100g. Don’t need to take the lactose into account. It’s recommend we eat no more than 5 – 9 teaspoons of added sugars per day. Remember to also take into account that you might eat more than the recommend serve size when calculating the sugar content. Other names for added sugars: White, castor, icing, brown, raw, cane, fruit, date, grape, demerara, invert, muscovado, beet, glucose, dextrose, fructose, galactose, mannose, lactose, maltose, polydextrose, maltodextrose, sucrose, malt, rice malt, barley malt, malt extract, corn syrup, golden syrup, maple syrup, rice syrup, syrup, molasses, treacle, honey, fruit-juice concentrate and modified carbohydrate. Also words ending in ‘ose’, malt and syrup are all sugars. When you see fructose and lactose listed in ingredients they are refined added sugars. The obvious gluten-containing products are breads, pasta, crackers, biscuits, muffins, pastries and cakes. Other names are: atta, burghul, dinkel, durum, farina, graham flour, semolina, spelt, kamut, triticale, pumpernickel, rye, barley, malt, malt extract, oats, and pilcorn. Depending on how sensitive you are to gluten and how much you need/want to avoid. I would suggest if you want to avoid completely stay away from packaged foods as much as possible. You can join the Coeliac Society of Australia for $95 per year along with a doctor’s referral letter and you will receive an awesome members handbook, which is perfect size to fit into a bag and have with you always. As gluten can be in things like sauces, stocks and other packaged foods that you might not think that are that obvious. These potentially damaging oils will be found in products like dips, sauces, pesto’s, crackers, rice crackers and baked goods. A good rule of thumb is to try to avoid the following: canola oil, corn oil, vegetable oil, soybean oil, grapeseed oil, sunflower oil, safflower oil and rice bran oil. About 70% of packaged foods contain soy whether it’s soy protein, flour or oil. About 90% of soy is genetically modified. Another reason to avoid big amounts of soy foods is they contain natural plant oestrogen’s that mimic estrogen in our bodies and may cause hormonal imbalances. Soy will be hidden in vegetable proteins and vegetable oils in ingredients lists in most packaged foods. Food additives are substances added to food to preserve flavour or enhance its taste and appearance. Some additives have been used for centuries; for example, preserving food by pickling (with vinegar), salting, as with bacon, preserving sweets or using sulfur dioxide as in some wines. With the advent of processed foods in the second half of the 20th century, many more additives have been introduced, of both natural and artificial origin. What additives are bad for you? MSG (Monosodium glutamate) 621 – It’s very difficult to avoid MSG, it is in lots of processed foods. We have to avoid it as best as we can. MSG is a white substance that looks like sugar with no real flavour but when added to food enhances the flavour of the food tenfold. MSG is used by the food industry as a flavour enhancer – to make us finish the packet. Some people believe that MSG has caused worldwide obesity as MSG can damage appetite regulation in the brain and kill brain cells. MSG is also sometimes used in Chinese, Thai and Japanese restaurants. People who are sensitive may have the following symptoms: swelling of the lips, bloating, headaches and migraines. There are other more serious reported symptoms; brain damage, eyesight impairment, long term memory loss and infertility. MSG is becoming harder to track down. Food manufacturers have found that consumers recognise ‘monosodium glutamate, 621’; and are taking advantage of a loophole in labeling laws and putting MSG into our food under other names or using free-glutamates instead. When it is added as an ingredient of another substance it need not be listed on the label. Free-glutamates – Glutamates occur naturally in foods such as soy, cheese, wine, tomatoes, broccoli, spinach and corn. Subject to processing, however, glutamate-rich foods split from the plant protein to produce free glutamates, which behave exactly like MSG. When you see the words ‘no added MSG’ or ‘Flavours (natural and nature identical)’, exercise caution. Products will most likely contain ‘free’ glutamates. When you see a six at the start of an additive number, beware. These are glutamates and flavour enhancers that have similar effect to MSG (621). Additives 620, 621, 623, 624, 625, 627, 631 and 635 can all potentially kill cells in your brain. Additive names that guarantee the presence of MSG are: yeast extract, autolysed yeast, textured protein, plant-protein extract, calcium caseinate, sodium caseinate, potassium glutamate and monosodium glutamate. Added/Refined sugar – We have to be careful not to consume excess sugar as it turns into fat in our body and can cause a range of health problems, including stress, tooth decay, yeast infections, arthritis, depression and obesity. The way we can find out if our foods have natural or added sugar is to read the list of ingredients. Here is a listed of added sugars: White, castor, icing, brown, raw, cane, fruit, date, grape, demerara, invert, muscovado, beet, glucose, dextrose, fructose, galactose, mannose, lactose, maltose, polydextrose, maltodextrose, sucrose, malt, rice malt, barley malt, malt extract, corn syrup, golden syrup, maple syrup, rice syrup, syrup, molasses, treacle, honey, fruit-juice concentrate and modified carbohydrate. Also words ending in ‘ose’, malt and syrup are all sugars. When you see fructose and lactose listed in ingredients they are refined added sugars. Artificial sweeteners or intense sweeteners (Numbers 951 – 967 are intense sweeteners) – They are 100x, even 1000x sweeter than sugar. Our poor taste buds are then becoming accustomed to that false sweet high. All artificial sweeteners have been linked to causing detrimental health conditions. For example Aspartame since its approval in 1981 has been in controversy debate. Scientific data shows that it causes brain tumours in rats. Since 1981 brain tumours have increased. I’m not saying that Aspartame is the only factor but I do believe along with a lot of scientist that it has been a huge contributing factor. Kids are more and more being given diet products for obesity and in turn consuming artificial sweeteners. A lot of us think we are avoiding artificial sweeteners if we are not having diet products but for example aspartame is more and more being used in products such as sausages and rice crackers. Always read food labels. The best thing to do is choose wholefoods and limit packaged foods as much as possible. Very informative article Angela. 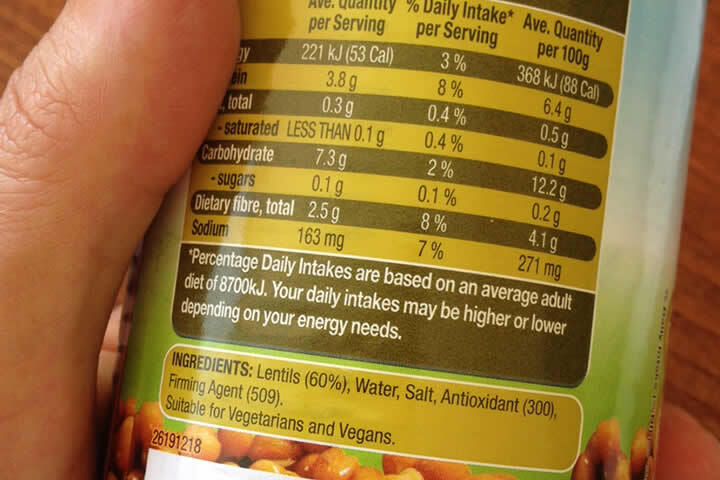 I have IBS and I am learning to read labels more, but they can be tricky, for this I’m trying to make most of my food from scratch and buy less processed food. 180 nutrition is my favourite breakfast and at least I know what I am eating. This is very informative. I will take note of the numbers for future reference. I’m in South Africa. Would the additive numbrs be the same here? Hi Angela, some things you said I already knew, but definitely not all of it. I found this a great and informative article, paticularly the gluten info, thank you. Thanks Jenny, glad you enjoyed the article. Hi, my issue is with what’s high or not in the carb intake. I know to look for no more than 5g per 100g of sugar but can you tell me what’s a good guide for carbs please???? ?